Thank you for another wonderful traditional cat show. It is always so much fun to enter and to see the pictures of all the wonderful kitties. Thank you especially for the prizes that you make. Both our Siamese sleep in the beds you made and play with the toys you made for them. Such a labor of love is appreciated by Bando and Neko and their humans. part of the day. You never know what they will decide to attach to, but it kept them busy for hours. I have now reclaimed it. Thank you for another great show and all your good work throughout the year. It was great sharing the good news with the two of you on Tuesday, I am still on Cloud # 9. What a fantastic thing to discover as a first when getting back on line after being off for about two months. Seemed that long anyway. An interesting fact is that I had skipped Page 3 and that is where I discovered Cy~Cy also had some wins. So our total is: six 1st place wins, five 2nd place wins, two 3rd, two 4th and two 5th place wins for a grand total of 17 wins. So we did really well for a first try. 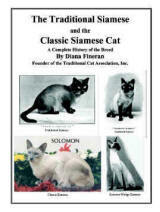 I am so elated that Royale Siamese was listed so many times on the result page. I have purchased a lot of books, done a lot of reading, and a lot of surfing the Internet, and would always log off thinking, "Darn! I have some really excellent cats here." So Meezer certainly has the right to hold his nose up in the air as if to say, "Don't you know in front of whom you are standing ?" And now that has been confirmed, so I thank the two of you did very, very well and I thank you very much for allowing me to share the in the joy of our adopted felines. I just keep logging on to the TCA website and looking through all the listings again and again. I can't believe it happened. When I realized that Sharon Weeks, his breeder, had submitted his photos in the contest and that I had won, I ... am very proud that my little guy won First Place as Best Traditional Siamese Kitten. Thank you to the judges. We are very proud of everyone of them. They did so very well. We are so thankful that there is a cat show for us to enter in. It is so exciting picking out the pictures to send in, the wait for the results, and then the excitement of seeing the results, too much fun : ) Thank you for making it a reality. We really enjoy doing it and we know it helps TCA out which makes us happy too. We really want to promote this wonderful breed and try to donate and do as much as we can to help out. We think the highest of TCA. ...thank you for all the nice gifts from the 2004 TCA photo show. I have already used all the litter pearls! I really do appreciate the nice things. Please thank everyone that donated for me!